Not A Record, But Audubon Set Still Sells For A Tidy $7.9 Million : The Two-Way Christie's New York today auctioned off a rare set of John James Audubon's Birds of America. It didn't come close to the record $11.5 million paid for another full set of the books in 2010. But it was still a hefty price. 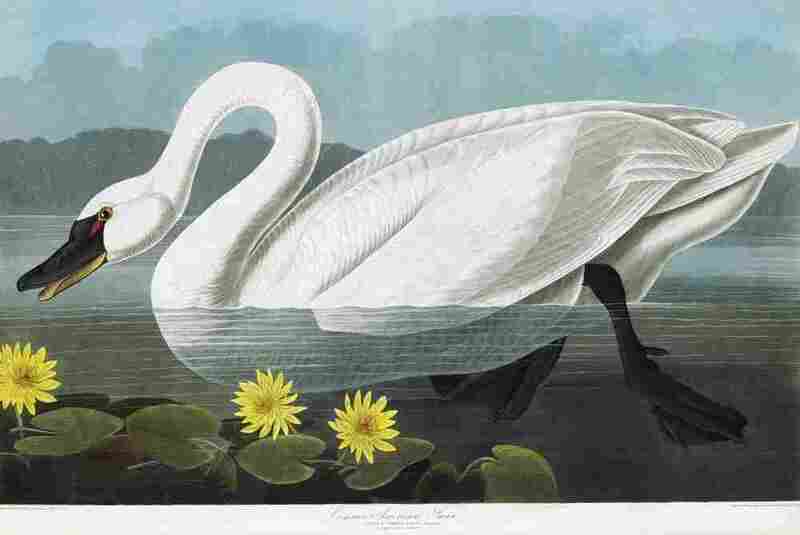 One of the 400 engraved images in the Audubon set: a Common American Swan. We wouldn't want to say that $7,922,500 isn't an awful lot to pay for one set of four books. But we do have to point out that it's not a record. Thursday, we previewed the Christie's New York auction of a rare set of John James Audubon's Birds of America. As we reported, there was talk that it might fetch more than the record $11.5 million paid for another full set of the books in 2010. Alas, Christie's says, the "hammer price" paid by an American collector was within the "expected" range of $7 million to $10 million — but not near the premium price paid two years ago.